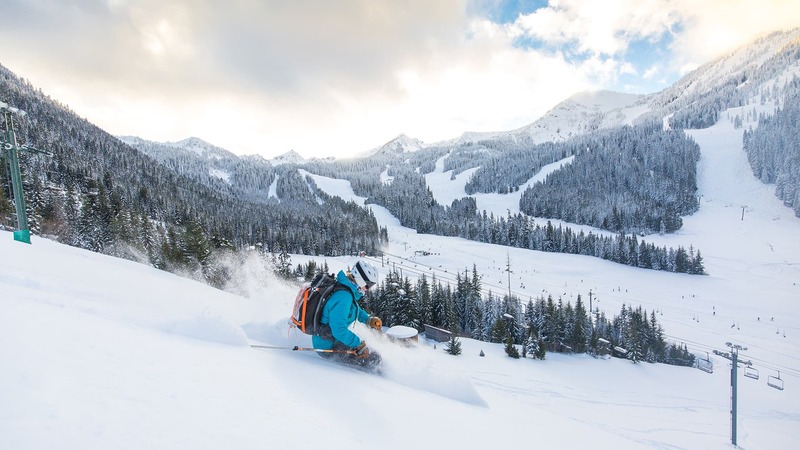 Whether you have the urge to shred some Pacific Northwest pow or feel like hopping the border into the Great White North, the Ikon Pass gives you access to three legendary skiing and riding destinations that are all within a few hours from Seattle. Head east from Seattle, and in just an hour, you’ll be in the heart of the Cascades at The Summit at Snoqualmie. Start your day by taking the legendary Edelweiss (also known as Chair 2) lift to the top of Alpental to access expert terrain and to snap a simply stunning selfie—with Mt. Rainier to the south and the Cascades to the north, you’re sure to feel like you’re in the European Alps. 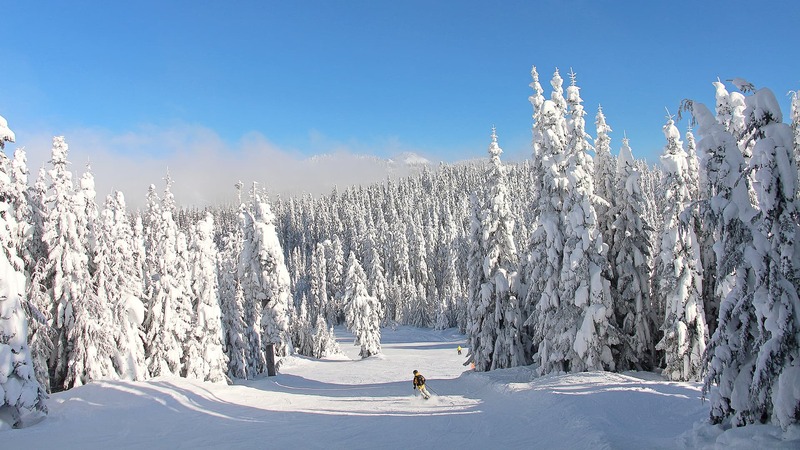 If the snow starts flying, either stay on Alpental or try out Silver Fir—and don’t miss the tree runs at Summit East, packed with hidden pow zones. While you could easily shuttle between The Summit at Snoqualmie’s four base areas, you could just as simply ski between them. Traverse like a local by taking the S-90 from east to west for three miles of intermediate adventure. Come back to the slopes after dinner to experience 541 night-skiing acres—the most in America. There are also more than 20 snow tubing lanes, each 500 feet long, that stay open into the night, complete with covered lift, which are a fun-filled, carefree option for friends and family members who didn’t bring their skis or board. Drive south to hit Washington’s biggest resort, Crystal Mountain, complete with 2,600 acres and 50-plus named runs. Day trip or weekend stay, keep a close eye on the Crystal Mountain Twitter account on the way there if it starts dumping—you’ll be the first to know when the Southback and Northway gates open, aka, score your free ticket to powder town. To access Southback’s technical terrain, take Crystal’s most legendary lift, the high-speed two-seater, Chair 6. By the time lunchtime rolls around, you’ll be ready to head directly to the local go-to, Bullwheel, for a Crystal Mountain Amber Ale—brewed exclusively for Crystal Mountain Resort by Pyramid Brewing Co. Regain your strength by sharing a pitcher with friends over a plate of Bullwheel’s famous Mountain Nachos, which feed at least four people. Skiing and RVing goes hand in hand, didn’t you know? When it’s time to turn in for the night, stumble back to your home away from home—conveniently located slopeside in Crystal Mountain’s B Lot. In the wintertime, this lot with 72 RV power hookups transforms into a friendly-yet-rowdy community of powder-hungry skiers and snowboarders. If you really want to make some memories, take or rent your own RV, and set up camp—but be sure to get there on a Thursday; otherwise, your chance to snag a weekend spot is slim. 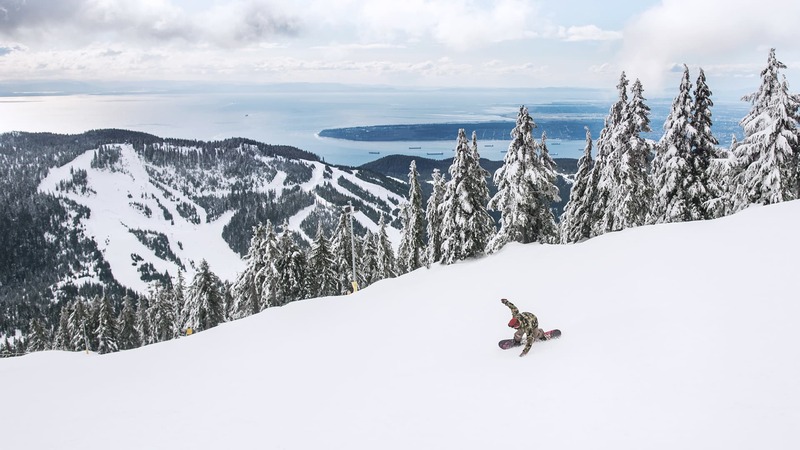 Travel internationally, if only for a weekend, by driving north to Cypress Mountain—Vancouver’s largest skiing and riding destination. Powder day? Hurry off to Sky Chair—the highest skiing and riding peak on the North Shore. While you’re at the top of Sky Chair, you’re also in one of Cypress Mountain’s prime selfie spots. Remember your trip by snapping a quick, snowy pic with the Lions or the incomparable Howe Sound in the background. Grab a bite and a pick-me-up between runs at the Crazy Raven Pub. Be sure to try the mouthwatering lemon pepper wings and a pint of Granville Island Brewing’s Cypress Honey Lager—with its soft malt flavor and a dash of locally sourced honey, this homegrown brew is sure to hit the sweet spot. Top off your legendary trip by squeezing in just a few more runs at dusk. With the largest night skiing operation in Western Canada, Cypress Mountain’s slopes are floodlit during the normal season until 10 PM to please the all-day diehards. And if your legs simply can’t take another turn, drive a quick 30 minutes to experience the bustling art, theater, music, and sports scene in downtown Vancouver.